Have you ever tried to substitute the eggs for 1/4 Cup Applesauce and 1/2 tsp baking powder? I’ve done it to substitute eggs in other recipes but I don’t know how it would turn out in this. If you have, let me know! I definitely want to give this a try. Hi Mitch – I haven’t tried it, but I’m curious to know how it works out, so let me know if you do! Why did you decide to leave the yogurt out next time? Hi Jennifer – I’m thinking of experimenting with leaving it out just because the extra bananas make the bread so moist already that I’m not sure it needs the extra liquid. On the other hand, the yogurt provides a nice tanginess, so it might be good to include it anyhow. I’ll report back once I’ve tried it, or if anyone else does, please let me know! Oh yum! I love my banana bread to be really banana-ey 🙂 I will definitely be trying this recipe! Try substituting your yogurt for sour cream – it makes all the difference in the world, and brings out an amazing addition of flavor to the bread, but not overly moist =) I can’t make anything banana-ee without sour cream now. This is exquisite. Thanks for sharing these recipes. I used your recipe (but added a touch of honey). It was. AMAZING. So moist and delicious. I didn’t even get to eat that much of it (my family got to it). Thanks so much for posting. 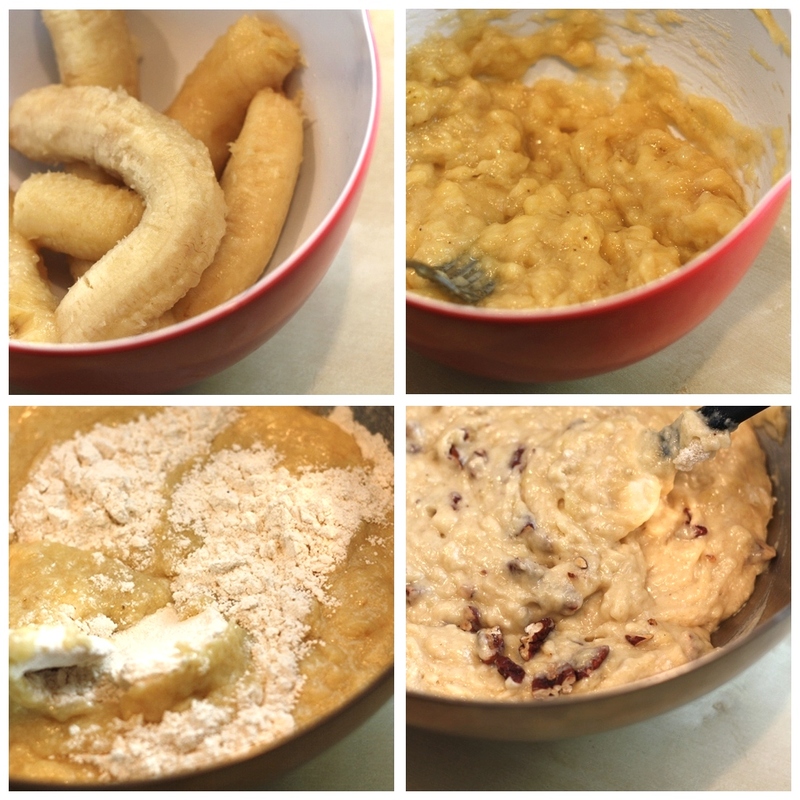 I’ve got 4 ridiculously embarassing ripe bananas in my kitchen bowl, just as you describe. So I guess they’ll be perfect for this! Ps. How exciting that your uncle is such a great cook! It always gets me excited to meet/hear of people that are amazing with whipping up stuff in the kitchen. Delicious recipe. I did try it with the applesauce instead of the eggs and it came out fine. Don’t know if it came out the SAME, but it did come out. I also used 1/4 cup of greek yogurt instead of normal plain yogurt. Greek Yogurt tends to resemble sour cream more in flavor and use than plain yogurt, so using sour cream instead of plain yogurt would probably work as well. 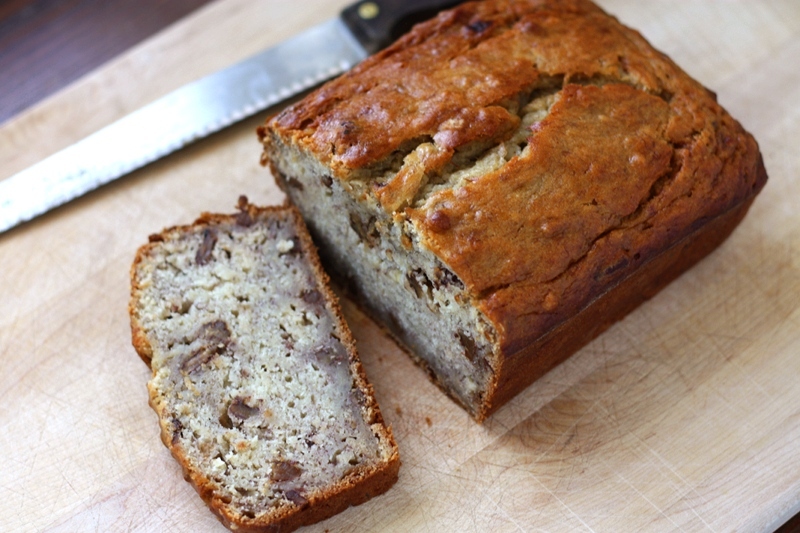 I’ve tried plenty of Banana Bread recipes but this is the best (to date). That extra banana makes a surprising difference. I also made it without the yoghurt. Still really moist. I used sour cream instead of yoghurt because I didn’t have any yoghurt. It came out very banana-ny and moist and the banana smell was beautiful. The only thing was I cooked it in three small bread pans and the sides were not as crusty as I would have liked. Not sure what to do to fix that. Otherwise, fantastic recipe. Thanks for sharing the tips. Hey I love this recipe….I did a little extra though and added some cinnamon and honey to the mix and it turned out great! You can also drizzle the honey on top of each individual slice if its not in the mixture already…it kicks it up a thousand. I’m truly a fan of moist bread and cakes and this is just as moist as I love it to be. Thanks for sharing this! Haven’t tried the recipe yet but wanted to let everyone know that if you freeze the bananas first this makes them more sweet and you can use less sugar. I am allergic to bananas, so I substitued strawberries (that I had picked last summer and froze) I also added a little cinnamon and used whole wheat flour. It turned out phenomenal! I only had 3 overly ripe bananas, so I used banana flavored yogurt instead of the plain. It was really good, thanks so much for posting this! I am a cook for a small hospital. 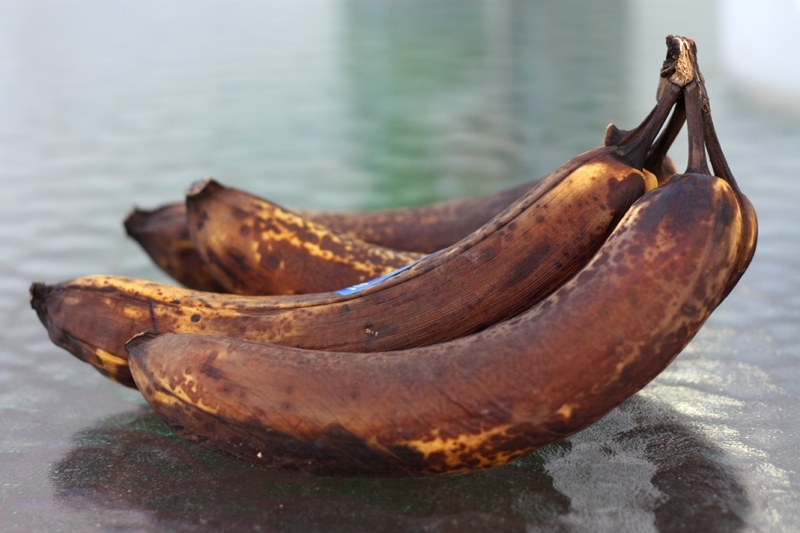 We seem to always have over ripe bananas!! I used your recipe with a couple of different twists. After greasing my bread pans I sprinkled cinnamon n sugar in the bottom of the pan and I added 1 t. caramel sauce to the batter! Excellent!! Very Delicious! I just made this recipe because I didn’t want to waste my 4 over ripe bananas and it’s very yummy! I think I over cooked it but it’s still awesome. Very moist! 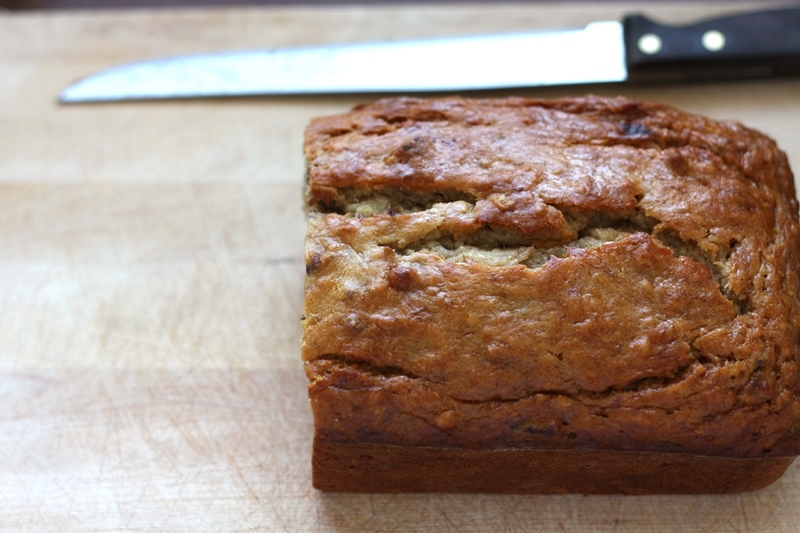 Please PLEASE add a pinterest so I can save this in my recipes….this is the best banana bread I’ve ever had and I hate losing it in my facebook feed. 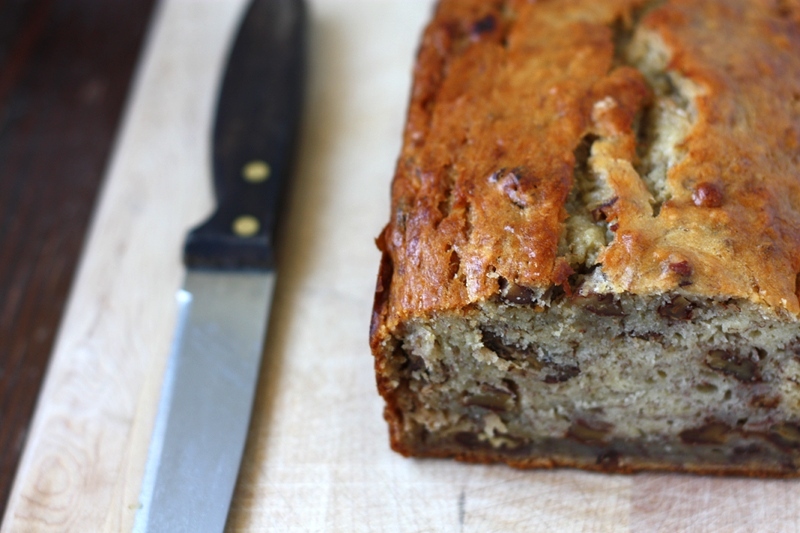 You are currently reading banana-y banana bread at one cake two cake.